Interest in mid-20th century British artists and the world they inhabited is growing internationally - prices are rising and exhibitions proliferate. This biography focuses on the couple who were at the centre of the Modern British art scene: Cedric Morris (1889-1982) and Arthur Lett-Haines (1894-1978). Both men studied in Paris in the 1920s where they absorbed the work of the French Post Impressionists, Cubists and Surrealists. Later in London, Morris became a sought-after painter of flowers, birds and landscapes, and a friend of Augustus John and Ben Nicholson. Lett was hailed as Britain’s first Surrealist. They gave fabulous parties attended by the cream of creative London. Morris and Haines founded the East Anglian School of Painting and Drawing in Suffolk, attended by Lucian Freud and Maggi Hambling. The atmosphere was described as ‘robust and coarse, exquisite and sensitive all at once, also faintly dangerous.’ The conversation was sometimes bawdy and bitchy but never boring. Lett-Haines, who ran the school, was a superb cook who swapped recipes with Elizabeth David. Cedric Morris became an award-winning plantsman and poppy and iris breeder. He was an acknowledged influence on Beth Chatto amongst others. 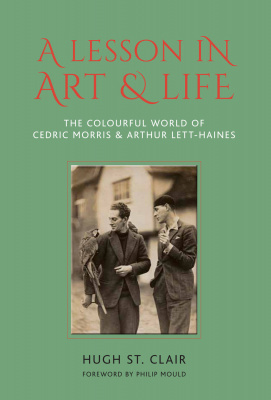 A Lesson in Art and Life is a long overdue biography of a couple who were hugely influential across the spheres of art, gardening and cookery. Hugh St. Clair is an experienced arts and design journalist with reviews and features published in numerous British and international magazines and newspapers from House and Garden and Country Life to The Art Newspaper and Bonhams auction house magazine. He has edited and written four books on paintings including three editions of Miller’s Pictures Price Guide and Miller’s Buying Affordable Art. Philip Mould OBE is an art dealer who, through his books, television work and numerous articles, has become one of the most recognized figures in the British art world. He is best known for his BBC programme Fake or Fortune?. Philip is also the author of Sleepers: In Search of Lost Old Masters (published in paperback as The Trail of Lot 163) and Sleuth: The Amazing Quest for Lost Art Treasures (sold in the USA under the title The Art Detective).